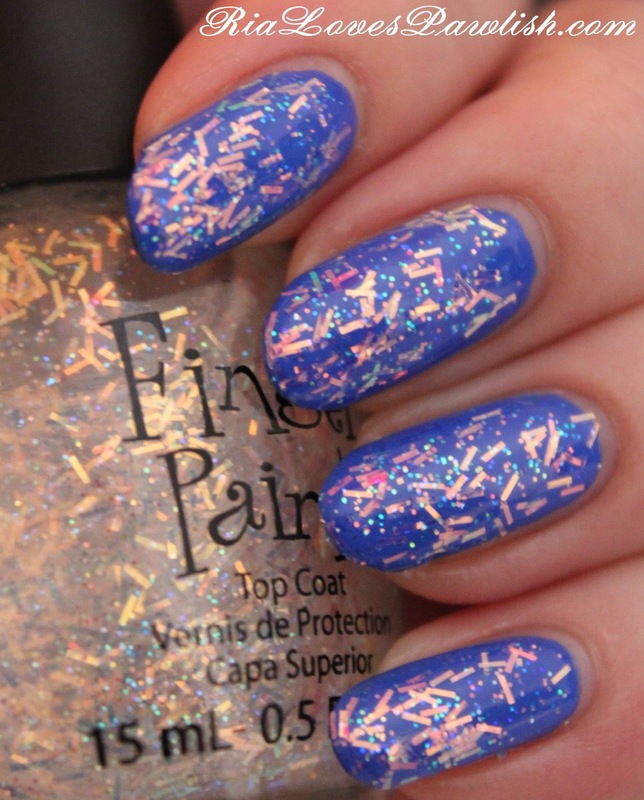 today i added Finger Paints Sparkle Top Coat to my Sally Hansen Xtreme Wear Pacific Blue mani... and i love the combo! i didn't want to take off Pacific Blue yet because it's so pretty, so i thought i'd just add a little something. i bought this polish a couple months ago (i think!) and it promptly got stuck in a drawer and forgotten because i never buy this brand. while the name is quite unimaginative, the actual product is beautiful! Sparkle Top Coat is a clear base comprised of bar and tiny hex glitter pieces. happily, while the formula is a little thick, it's easy to work with and there isn't much patting needed to spread the glitter evenly! i would definitely use an actual topcoat to smooth out the roughness of the pieces and bring out all the shinies. one coat Sparkle Top Coat, one coat Seche Vite over my Sally Hansen Xtreme Wear Pacific Blue mani. it's even better than i'd hoped it would be in the bottle!